The idea of putting MAX underground through downtown Portland has been around for some time, and I’ve had a concept for a MAX subway that, with the help of an ancient version of CorelDraw, I finally sketched out recently. It’s inspired in part by a basic concept I vaguely remember from an long-ago Tribune or Oregonian article (it could have been something proposed by Jim Howell’s group but I’m not sure) that I’ve fleshed out in my head over the years. Click on the map for a higher-resolution version. What If the SW Corridor Started on the East Side? Extending the Yellow Line south to Tualatin should be considered in the SW Corridor Plan. It would provide a north-south rapid transit alternative to I-5, which is becoming increasingly congested. The line would extend 19-miles between Vancouver WA and Tualatin with at least 24 stations providing connections to rest of the transit system. I propose it traverse the central city on the east side and south waterfront thus avoiding the slow downtown operation that plagues the Blue and Red Lines, and serves OHSU with a deep tunnel station similar to the one at the zoo. Note:Building a tunnel for light rail is not necessarily more expensive than building it on the surface. Land values can drive the cost of surface construction to great heights. The 2.9-mile Robertson light rail tunnel through the West Hills, with one subway station, opened in 1998 at a cost of $184 million. That underground work would be about $290 million or $100 million a-mile in today’s dollars. Compare this to the 7.3-mile Milwaukie Line, now under construction above ground, costing $1.5 billion or $200 million a-mile. Following is a brief description and map of the line. This 1.7-mile segment could run on the surface along Water Avenue or on a structure above the UP Railroad tracks on First Avenue. It should have three intermediate stations at the bridgeheads for connections to all the eastside bus lines that cross the Willamette. This segment, with a new platform adjacent the OMSI MAX Station, shares the new Willamette River Bridge and South Waterfront Station with the Orange Line. This 2.8 mile-long tunnel would have an east portal immediately west of the South Waterfront Station and a west portal at Burlingame. It would have a deep station to serve “Pill Hill” and a Hillsdale Station to provide a connection to the frequent bus lines on Beaverton-Hillsdale Highway. This 4.2-mile segment could run on the surface along I-5 and Barbur Blvd. It could have three or four stations. They would be at Burlingame, the Barbur Transit Center, and one at SW 72nd and Barbur Blvd. The line would enter the WES right of way at the Tigard Transit Center. An alternate alignment could be in a tunnel between The Barbur and Tigard Transit Centers with a subway station at PCC Sylvania. 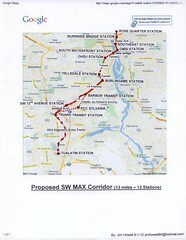 The possibility of adding a 3.8-mile section of electrified track in the Portland and Western and WES rights of way in order to extend MAX south to Tualatin should be considered. MAX could possibly share the WES platforms. City of Portland engages in outrageous $2M power-play against TriMet. In a move which apparently came as a complete surprise, Portland mayor Sam Adams has proposed levying/hiking various fees on TriMet, related to things like benches and shelters. The amount of the proposed fee hike is 8000%, or about $2M; intended to cover the cost of the YouthPass program, which was cut by TriMet in the latest round of budget cuts, after the Oregon Legislature last year stopped funding for the program. State funding ended in 2011, and TriMet has been subsidizing the program for the past half-year. TriMet reports that it was caught off guard by the measure, and is studying its options. I’ll be blunt. This is an outrageous maneuver by the City of Portland, for many reasons. The YouthPass program is highly defensible, and ought to be funded somehow; but this is NOT the way to do it–a power-play like this has the potential to be incredibly damaging to regional co-operation in the future. Whether or not the city of Portland will follow through with this, or this is just a negotiating ploy, remains to be seen. It’s interesting to note that the item was put on the “consent agenda” for Wednesday’s city council meeting (the consent agenda is for routine and uncontroversial matters to be passed in one motion, without having to waste time to consider and vote on each one individually). This means that either it has unanimous support of the City Council–which would surprise me, especially for an acrimonious proposal such as this one–or Adams is bluffing. The immediate reason: The City is taking on the wrong target. If the mayor really wants to play hardball on this issue, he ought to go after the source of the problem: the state Legislature, which ended its support for the program in 2011, but which continues to subsidize suburban yellow bus service. Mayor Adams (and Portland Public Schools) could easily make a credible threat to Salem: Restore YouthPass funding, or PPS will replace it with yellow bus service, which the state is required to support under Oregon law. YouthPass is cheaper to operate than equivalent levels of yellow bus service, so restoring YouthPass funding would cost taxpayers less than having to support yellow busses in Portland. Of course the Legislature could try and exempt Portland from the yellow bus subsidy–screwing over PPS seems to be a popular past-time in Salem–but the optics would look far worse (including to those who don’t care much about public transit) than the current state of affairs. Where does Portland think TriMet will get the $2M? Unlike some transit advocates outside of government, who seem to think that TriMet is hiding the ball with its budget crisis (and cutting service in preference to cutting various alleged items of pork-barrel spending), the City of Portland likely has far better visibility into TriMet’s finances. Either it know where the bodies are buried (to paraphrase Norma Paulus), in which case it ought to be forthcoming about this, or it knows that there aren’t any (and perhaps doesn’t care). In addition, it’s entirely fair to point out that a good portion of TriMet’s operational commitments are on capital projects that Portland has either championed, or operates outright (such as the Streetcar). If Portland gets away with this move–and especially if this results in service cuts outside of Portland–who’s next? If TriMet further cuts suburban service, will suburban communities then respond with retaliatory fees of their own, or threaten to withdraw altogether? Could this lead to an end to regional transit service, as each city looks to operate their own agencies (or not), lest a dime of “their” tax moneys subsidize so much as a revenue-minute of service outside of their borders–with crosstown trips requiring paid transfers at every municipal boundary, with little co-operation on matters like schedules? The last time TriMet was subject to a power play of this sort, depending on what rumors you believe, the result was WES. (Washington County, with its strong industrial base and relatively low number of service hours, likely subsidizes the agency with payroll tax revenues collected within). Even OPAL, which has been sharply critical of TriMet over the years, has come to the agency’s defense on this issue, which Jonathan Ostar called “concerning”. Regardless, this sort of power play can’t be good news. Local governments around the country have been suffering under the combined weight of loss of federal support, decreased tax revenues due to the recession, increasing pension and healthcare expenditures, and increasing levels of anti-government activism. Many of these wounds are self-inflicted, but have been building up for a long time. If the response of governments to the funding crises is going to be to try and screw each other over, nobody is going to win (except perhaps the Brothers Koch and their ilk), and everybody is going to lose–in particular, those who depend on the government for their education, transportation, or other vital services. Hat tip to Al M, who got there first in the open thread. Last week was a bit busy, and I didn’t have time to comment on the new Metro Safety Report.